Bookings are open for the new weekday Hawera-New Plymouth bus service. 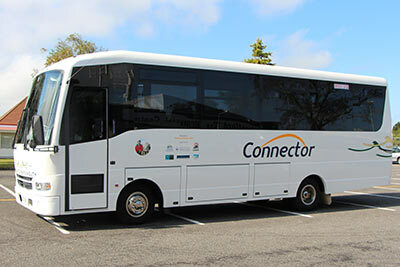 The Hawera-New Plymouth ‘Connector’ will make four return trips daily from Monday to Friday, operated by Pickering Motors under contract to the Taranaki Regional Council and with funding support from the region’s three District Councils, Taranaki District Health Board and WITT. Bookings made for Taranaki DHB patients and visitors are to be completed through reception at Base or Hawera Hospital or one of our Health Centres. 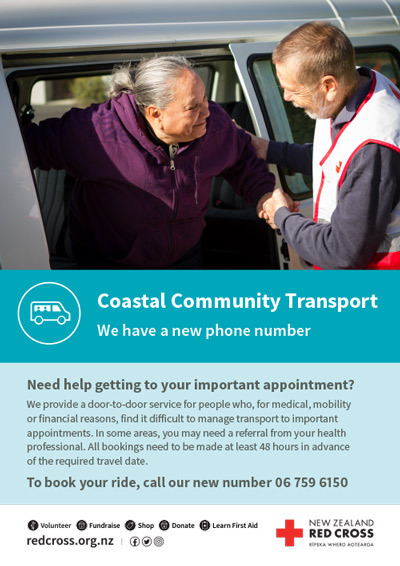 This free service is for Coastal Taranaki residents needing to get to essential commitments such as social service, medical or hospital appointments in New Plymouth, Stratford or Hawera. Eligibility criteria does apply, please see the flyer below for more information. 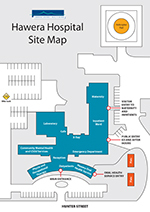 Patient and health-related visitor parking areas are marked with light blue lines, as marked on the parking map below, with additional mobility cardholder parking available near the main entrances. Specified Mother & Baby parking is available adjacent to the Antenatal Clinic and outside the Child & Adolescent Community Centre (CACC). 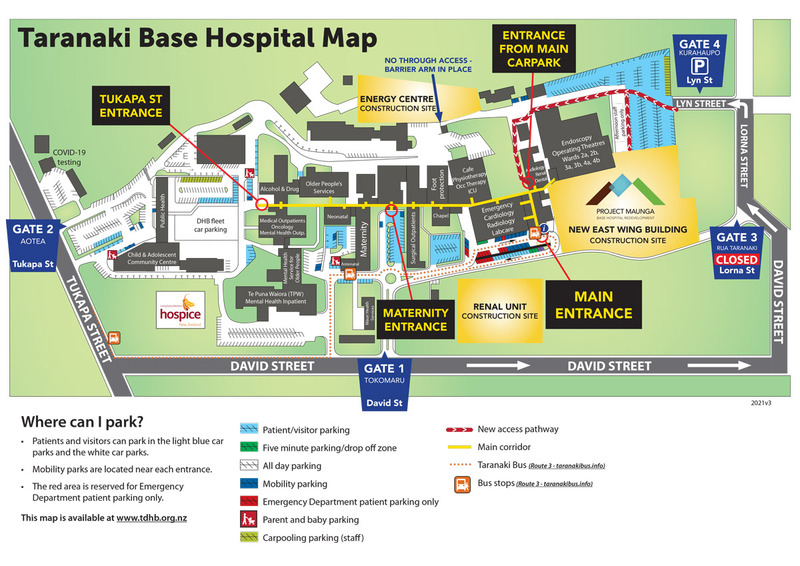 The main public car park at Taranaki Base Hospital is located off Lorna Street, near the St John Ambulance station. Surgical Outpatients, Physiotherapy and Maternity parking is located in front of the Maternity entrance and in front of the Chapel off David Street. The CACC and Medical Outpatients/Oncology have car parks off Tukapa Street . Parking in front of the Emergency Department is limited, therefore reserved for those attending the Emergency Department. Patients and visitors attending other areas of the hospital are requested not to use Emergency Department parking at any time. Areas marked with white lines are available for use at any time. Cars parked in the wrong spot may be clamped and/or towed. Click here to view the Taranaki DHB Parking Policy. Click here to view the Clamping and Towing procedure. Got feedback about parking at Taranaki DHB? Let us know via our online feedback form. Click here to see route 3 that stops at Taranaki Base Hospital. Buses will stop outside the Antenatal Clinic and the bus shelter outside the Main Entrance. Visit the website www.taranakibus.info for information on public bus services in New Plymouth, Bell Block, Waitara, Oakura and South Taranaki.